"Full marks and all stars!" 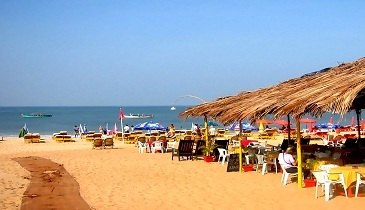 I was looking for Goa package for my family and Mr. Naveen helped me for that. He gave me a superb deal. I checked so many agents online, u can see so many options then u become confused to whom u go with, but when i spoke with Naveen, my all confusion is clear. He helped me a lot to select the package. I am totally impressed with Dpauls. I personally recommend Naveen and dpauls to book the tour. Full marks and all stars! I was planning for Goa this may, i think this is the only best deal available in whole travel industry. grab the opportunity! "Very well managed tour n great property"
Dear dpauls, I like to thanks to all of you for the best hospitality n best response to my parents at Goa, as I told you earlier I was really worried because they are aged but I am so glad that they are very happy, and I am really thankful to you people. Your efforts are very appreciable, keep it up. i was planning for vacation wid my friends for Goa in the month of May. was about to book ONLY FLIGHTS worth rs. 10,500 dat 1 of my friend told dpauls is providing complete package wid same cost nd includes Airfare as well as stay for 3 nights wid breakfast. I did not evn wait for a Minute to Grab dis Amazing Deal!! Thanx dpauls! "Great Hotel at great prices!" We were 3 couples and wanted a good hotel in less prices because vacation gets too pricy even after flights and hotels are done so its good to save as much money possible in the beginning. After a week of sleepless nights surfing for a good hotel, we finally booked this one with dpauls. at 18k including prices, it looked like a fair deal. the hotel was better than expected and wagah border gives really nice punjabi food. it was a lovely vacation and in our budgets! the complimentary candle light dinner by the resort on our anniversary was such a great surprise! when you go there, have dal makhni it was really nice! I bought a Goa Package from you Guys and it was gr8 arrangements made by u. My friends suggested me 2 get it from MMT or Yatra but i wanted d same at lowest cost possible. When i went thru ur website, i saw a Goa package which was just for Rs 13999. Without wasting much time i jst booked it online for me nd my frnds as well as dis was BEST DEAL i could opt for. It included- Flight, stay at La Gulls Hotel, Cab facility frm Airport and daily breakfast in the restaurant. In short, it was d Best i could get in just Rs. 13999. Thanks all. I will suggest your package to all my friends now. It was the best friend;s get together of my life! Thanks to Shruti who suggested us to take this package where we got all our meals FREE! Our hotel also got upgraded. Goa is superb! This hotels name pulled me to it and i must say, all for the good. friendly staff, yummy food and very close to the beahc. i loved early morning walks along the Arabian sea. Grill nights were awesome and Friday Evening Party was absolute fun with new friends. very nice! and i have seen dpauls never charges a penny extra! "Go Goa for the best New Year Party!" We were about 8 friends and we had hell of a party at Goa this New Year! it was great plus we also got free upgrade to 3* hotel which was a pleasure. i am amazed how dpauls comes with such alluring offers always! now get some great offer for Kerala guys!